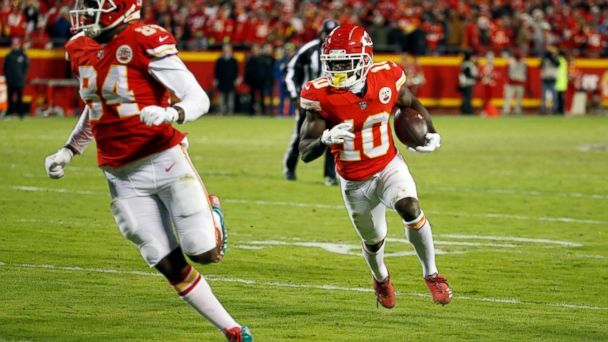 A police investigation into the abuse of a child is underway at the home of Kansas City Chiefs star Tyreek Hill, according to police reports. Two police reports in the past two weeks detail an investigation into allegations of battery, child abuse and neglect at the Overland Park, Kansas, home. The police reports were obtained by Kansas City ABC affiliate KMBC. Hill is not mentioned in the police report from Thursday, but his partner, Crystal Espinal, is listed under "others involved." The victim, listed only as a "juvenile," suffered a minor injury in the incident, according to the report. Both Hill and Espinal are listed under "others involved" in a police report from March 5. Overland Park police responded to Hill's home for a report of "child abuse/neglect." Hill has not been charged with any crime. The Kansas City Chiefs acknowledged they were aware of the incident in a statement. "The club is aware of the investigation involving Tyreek Hill," it reads. "We are in the process of gathering information and have been in contact with the league and local authorities. We will have no further comment at this time." The 25-year-old has one child with Espinal, who was pregnant when she accused Hill of assault while he was a student at Oklahoma State in 2014. Hill pleaded guilty to battery and was sentenced to three years probation and anger management classes, according to ESPN. He was also cut from the football team at Oklahoma State. Hill has been elected to the Pro Bowl in all three of his seasons in the NFL, all with the Chiefs. He was an All Pro as a returner in his rookie season and as a wide receiver last season. He has twice finished in the top 10 in the league in receiving yards. News of the abuse incidents broke on the same day Kareem Hunt, Hill's former teammate, was suspended for eight games by the league after video emerged last year of him shoving and kicking a woman in February 2018. Hunt was immediately cut by the Chiefs, and later signed with the Cleveland Browns. Hill's agent did not respond to a request for comment from KMBC.